You may like deviled eggs. But do you make them often? Evidently, few people do. That’s why this recipe for Deviled Eggs Will Make You Popular at Potlucks. They are mildly flavored with a sweet and sour twist and nothing weird to scare the kids off. 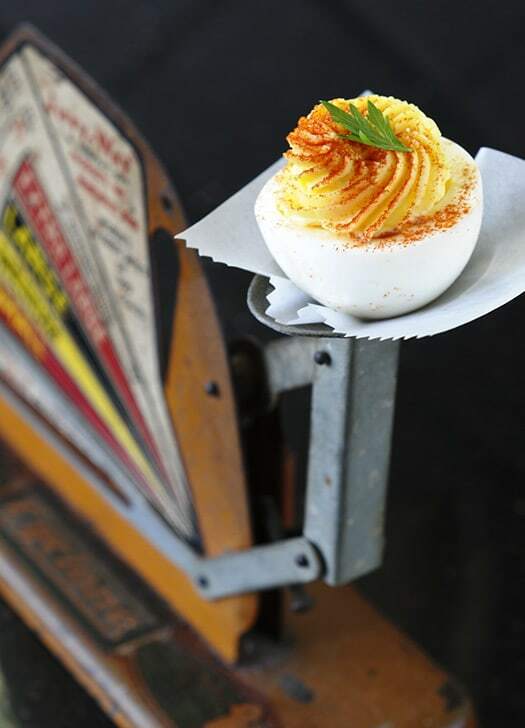 The deviled egg is displayed on an antique egg scale borrowed from a friend. If you’re interested in food props, be sure to read to the end about the various places I find my props. Then, check out my storage system. What is your favorite dish to take to a potluck? I made deviled eggs for years without a recipe–always trying to imitate my mom’s eggs. The results were unpredictable and not always the greatest. However, a few years ago, my older sister whipped up a batch of her deviled eggs for us to snack on during a car trip. We were headed home to Texas from her house house in northern Alabama. At any rate, I was astounded when she sent me the recipe. Couldn’t believe how simple it was. Before I get to the recipe, I’m taking a momentary detour. If you’re not a food blogger who photographs everything you eat, feel free to skip the next few paragraphs and go straight to the recipe. My friend and co-worker, Debbie H. loaned me her egg scale for the post picture. She recently inherited it from her grandmother’s estate. Love the colors and design. I found the crinkle cutter on a recent trip to Canton (a once-a-month humongous flea market here in Texas). The orange handle sold me. Now what else can I use it for besides eggs? Carrots maybe? The wire egg basket came from Hobby Lobby. Fake vintage. Sometimes that’s the best kind. No rust. See the plate with a gold rim in the picture below? Found it at Canton, too. It was part of a huge lot of restaurant china the vendor had bought out of a barn. I purchased several thick, white plates. Slightly retro. Perfect for pictures. The ceramic egg holder came from Jo-Ann Fabrics. Curiously, they were clearing their Easter merchandise at half-price 3 weeks ago when Easter was still more than two weeks away. Just in case you don’t have your own method, this is the way I cook eggs so I won’t get that icky green layer around the yolks caused by over-cooking. Place 6-8 eggs inside your Instant Pot or other electric pressure cooker with a rack or grocery store steamer inside. Add 1 cup water. Set to HIGH PRESSURE for 5 minutes. When done, allow pressure to release naturally for 3 minutes. Open Instant Pot and remove eggs to ice water to stop the cooking. When eggs are cool, pour out most of the water and gently shake the eggs within the bowl until shells are cracked. Peel eggs. Deviled eggs with a mildly sweet and sour twist. Remove shells from eggs. 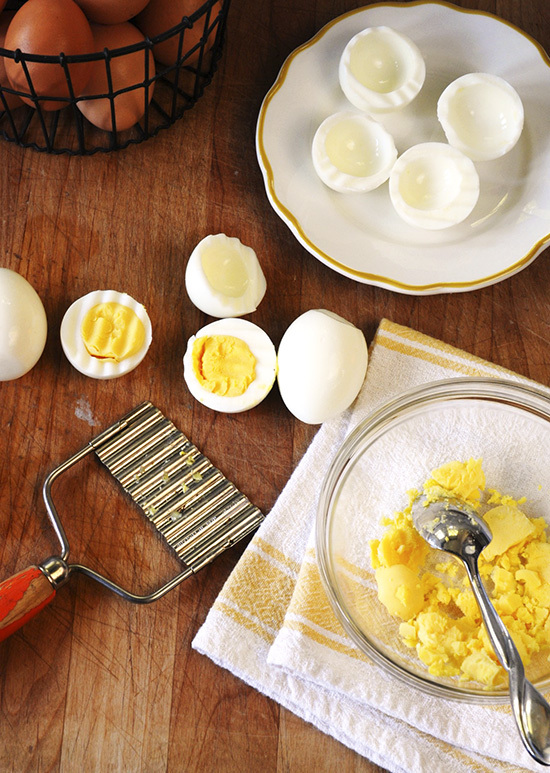 Slice in half and remove cooked yolks to a small bowl. Add vinegar, sugar, Miracle Whip and salt to yolks that have been mashed with a fork. Mix and mash with a spoon or spatula until yolk mixture is as smooth as possible. 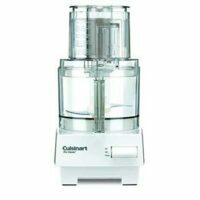 (If you happen to be making a double batch, a food processor might be more efficient). If eggs are too stiff, add more Miracle Whip to suit your preference. Spoon or pipe egg yolk mixture back into egg whites. Garnish with paprika if desired. 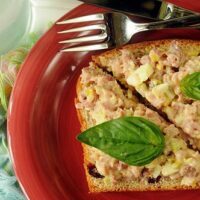 Posts Related to "Deviled Eggs That Will Make You Popular at Potlucks"
Ham salad sandwich spread made with leftover ham, hard-boiled eggs, pickle relish and mayo. Durkee's Famous Sauce and Basil make this recipe memorable. 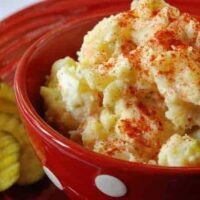 A classic potato salad with homemade cooked dressing-- tangy but no mustard. 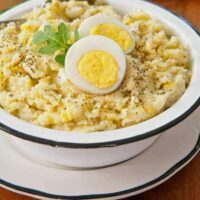 Cauliflower substitutes for potatoes in this American classic. Almost like my mom made them, with the vinegar and sugar, but she added a little mustard too. Lately, I’ve been adding green onions to the filling and a pinch of cayenne, and I garnish them with green onions on top. Regardless of the exact recipe, I’ve learned that they taste better if the filling is made in the morning if they are to be served in the afternoon or evening. The flavor really develops nicely. Christopher, I totally agree about making the filling ahead of time. I call the eggs, Angel eggs. I hate to give the devil all that credit for something so good. I love them. Will try your recipe next. I have smoked paprika so will give that a try. Never thought of using a crinkle cutter on them. Makes them look so nice. These are so good! I think the smoked paprika is really important. I am on a low carb diet so decided to try these as a snack. Then I ate four eggs in two days and can think of nothing else. I think these will be a perfect Easter treat next weekend! I hope you and your family are doing well! Are you coping with part of your family being so far away? the web brought you into my home! I use sweet pickle juice instead of vinegar and sugar. I use a plastic bag with a small corner cut off to pipe the yolk mixture into the whites. Makes clean-up easier. That top egg is the prettiest dang egg…ever! Now I want deviled eggs and chili. Beautiful! And I’m like you, I love to make food look pretty whether with props or fun arranging and garnishing. 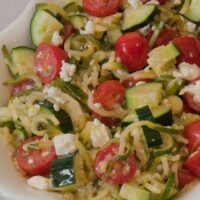 Your photos are incredible….. and thanks for a great sounding recipe also, perfect for the picnic, party season coming up! Yum!! I’m a huge fan of deviled eggs, and Easter is the perfect excuse to make them. I love all your pretty props, Paula (and of course your beautiful photos!). The piped filling makes it so much more aesthetically pleasing to look at!! I will be deviling my Easter eggs in the next day or two. I’m curious about which direction you cut your eggs–looks like you have cut them in half width-wise–I’ve always cut mine length-wise. 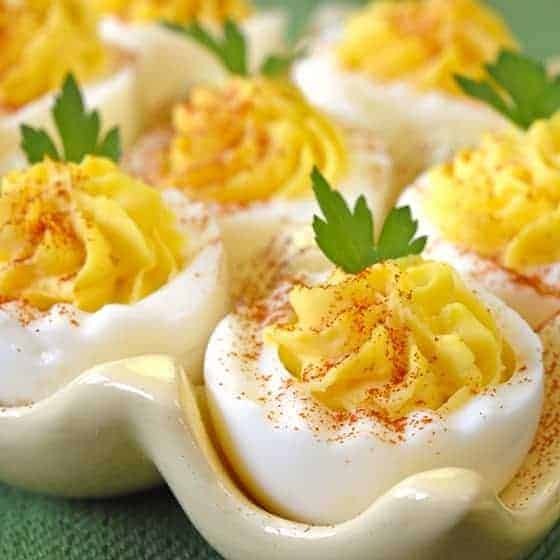 We love deviled eggs, always a part of our family feasts:) These are beautiful! Wish mine looked as pretty! Happy Easter to you, Paula! I am so thrilled to find your blog!! I’m also one of those who love to cook and trying to watch what I eat kind of girls….you have soooo many great things that I can’t wait to try!!! I am a Texan living in Nebraska so it does my heart good to read about “Canton, Hobby Lobby, Apple Bueno, etc.” and Oklahoma Christian! Off to experiment, once I decide which recipe to try first!!! You take the most amazing pictures! These are beautiful and look divine! I love deviled eggs. I absolutely love your pictures (as always)! My mother-in-law taught me to make a single deviled egg by simply mixing a spoon of O’Charley’s honey mustard with the hard-boiled yoke, and it is very similar to mom’s eggs! Love the single deviled egg idea! But I’ve never seen O’Charleys. Will be on the lookout. You’ve never had O’Charley’s honey mustard??!!!! Love the slicer trick for leaving the pattern cut marks…stealing that idea for sure! Thanks…they all look just lovely. I haven’t made (or eaten) deviled eggs in decades– they usually look unappealing, squishy, overly “handled.” But THESE– wow! They’re beautiful! Must make for our Easter get-together. Hope I can find a crinkle cutter! Paula, those pictures are gorgeous! I love the sunny, springtime yellow of those eggs–they made me smile. Instructions on how to eat my mom’s deviled eggs. 2. Squeeze the top of the sides of the egg together and use your top lip to rake the excess yoke mixture into your mouth. 3. Finish off the rest of the egg in one big bite. 4. Lick your fingers. Yummy! I have never seen a more beautiful egg. Great eggs and a super presentation! Have a wonderful Easter weekend. Just got off the phone with my daughter and we had just been talking about deviled eggs for Easter dinner. She thought it was a great idea. Then I pulled up your new post. If mine could look half as good as yours I would be soooooo very happy. I need to check into that icing shooter. Perfect look!!! Sandy, the icing shooter is from Pampered Chef I think (it was a gift). You are welcome to borrow it anytime. See ya Sunday. Mmmm. . . .one of my favorite foods to eat!! Gatherings just aren’t complete without deviled eggs. Thanks for sharing!! yum! is that the pampered chef icing shooter i got you a while back? whatever it is, it makes pretty eggs! Yes, it is Susie. Works perfectly for the filling. Almost easier than two spoons. i agree! since i don’t have this nifty gadget, another thing that works well is a ziplock bag with a small hole cut in the corner…a disposable pipet for deviled egg filling, works great!